Life is full of ups and downs: some days we’re on Cloud Nine, and others, we’re working our way through a rough patch. 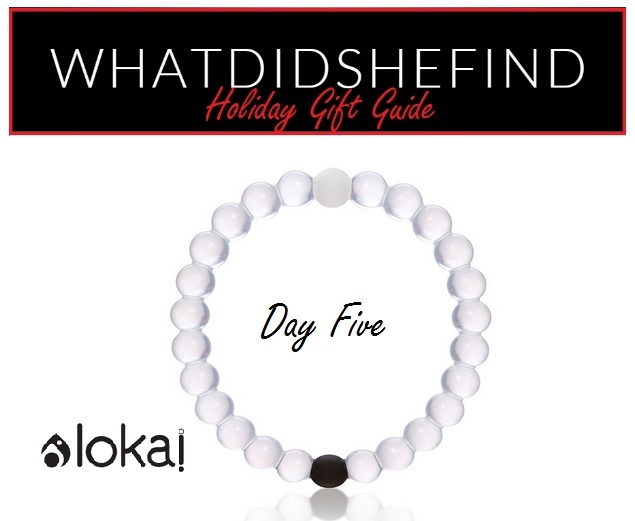 Today’s gift of the day, the Lokai Bracelet, symbolizes this by incorporating elements from Mother Nature’s highest point: Mount Everest, and lowest depth: the Dead Sea. A single bead on the bracelet holds water from the infamous mountain, while another single bead contains mud from the Dead Sea. Either bead can be found at opposite ends of the bracelet, representing the need, desire, and importance of finding balance in life. You can purchase the Lokai Bracelet for $18.00 US on the Lokai website (shipping ranges from $5.00-$20.00 US, depending on your location and the number of bracelets you purchase). The bracelet comes in 3 different sizes: small, medium, and large. You can also choose to share a picture of your bracelet on Twitter or Instagram, using the hashtag “#livelokai”, for a chance to be featured in their online gallery. Additionally, 10% of the net profits of each bracelet will be, “dedicated to giving back to the community through a variety of charitable alliances” (Mylokai.com). What’s better than a holiday gift that keeps on giving? I’ve likely mentioned this in previous posts, but hey, what’s one more time? 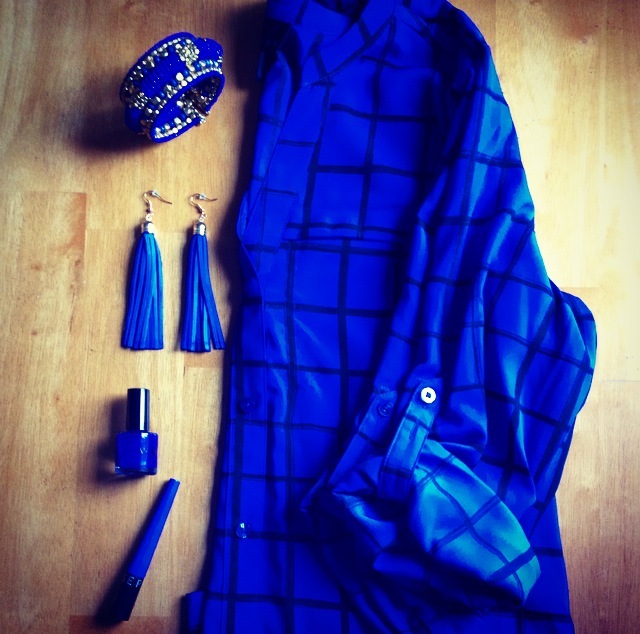 Cobalt (or “royal”) blue is my absolute favourite colour. It’s universal, complimenting nearly every skin tone or hair colour, and can be worn year-round. Looking for some inspiration? Just Google Kate Middleton. And, while I may never be royal (pun intended), it’s kind of fun to dress like one, right?! 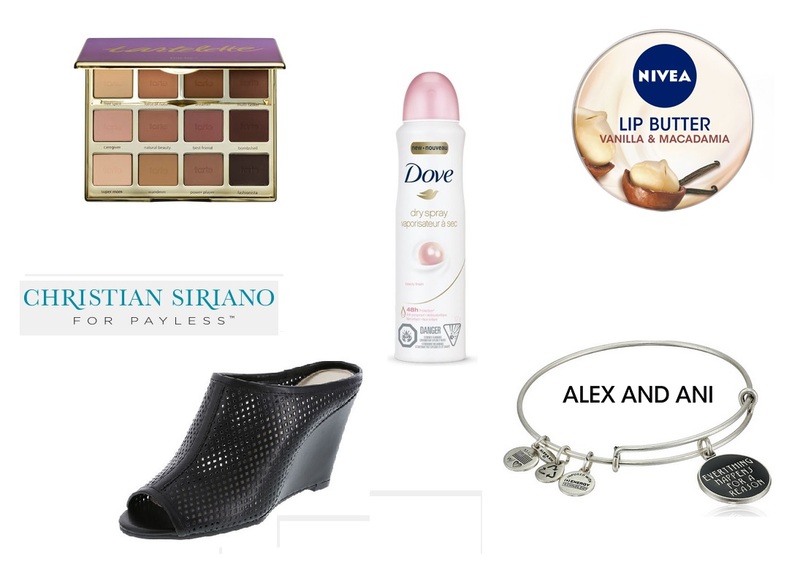 Here are some of my current cobalt favourites, from jewelry, to clothing, to makeup. I’d been eyeing this shirt for a while, and was excited to find it on sale during a recent cross-border shopping trip! Use this to add pizazz to a smoky eye, or wear alone with mascara. Vibrant, pigmented colour that lasts all day! Paired with a glossy top-coat, 2 coats goes on smoothly and gives you rich, intense colour. 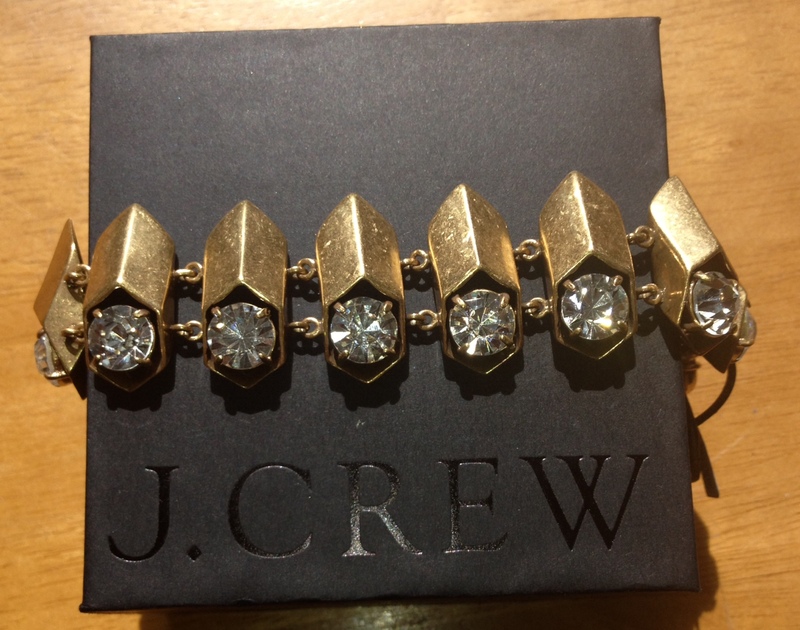 I love this cuff bracelet; gold pairs so beautifully with royal blue. Wear it lower on your wrist, or closer to your elbow for an even more “Grecian” feel. 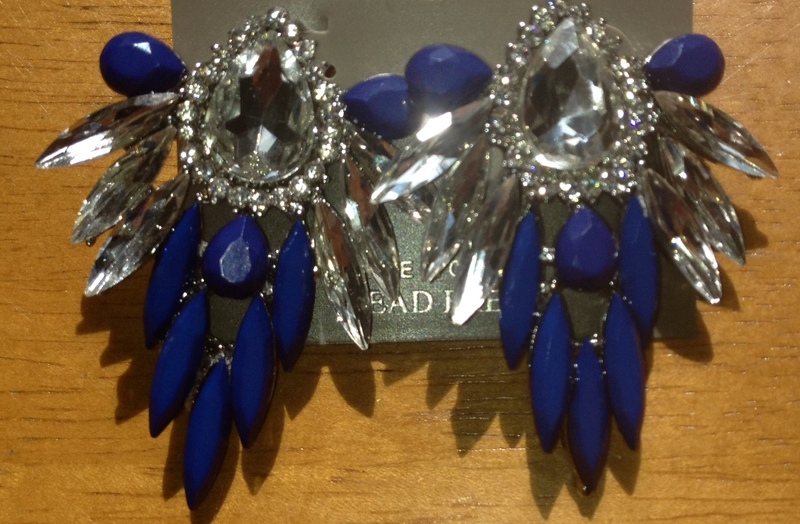 I love both the look and the price of these adorable earrings. I paired mine with wavy hair, but they’d look great with an updo, too! What’s even more fun? Shopping at the store they came from. A unique concept of food and fashion, Tou Jours offers great prices, friendly staff, and ensures you’re never shopping on an empty stomach! When it comes to jewellery, I’ve always leaned more towards colourful, affordable fashion pieces, and over the last few weeks, I’ve accumulated some new items to add to my collection. 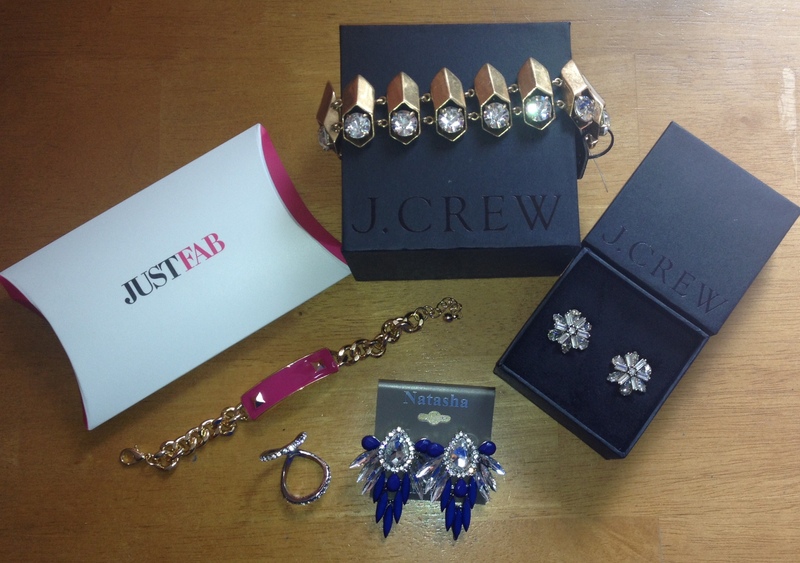 I did some in-store shopping at J.Crew and Winners, and some online shopping at JustFab. More info on my finds, below! 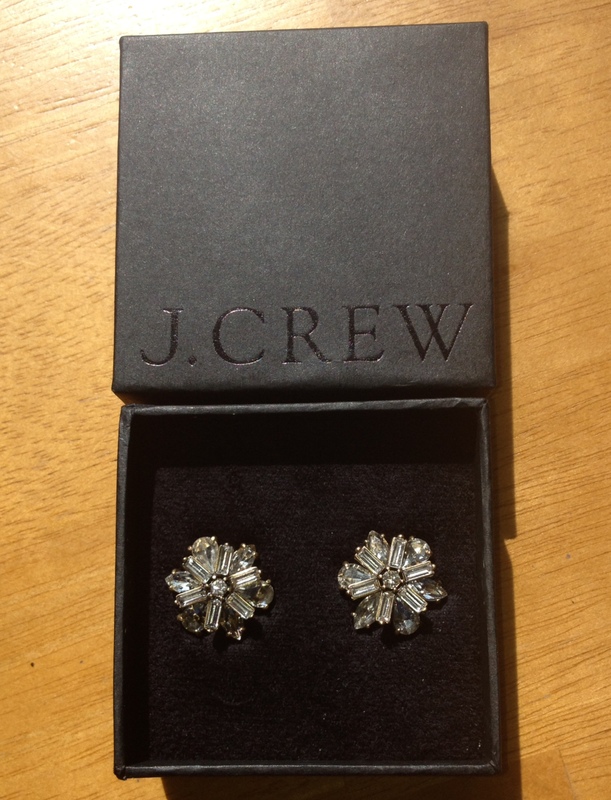 Lately, I’ve been loving oversized, shiny studs, and when I saw these in-store, I knew I had to have them (unfortunately, I can’t seem to find them online). What I love about these earrings is that you can pair them with a cocktail dress, and they’ll look classic and elegant, but you can also wear them to help dress up simple skinny jeans and a t-shirt. Another thing I love about them, is that the earring backs are incredibly durable and sturdy. (Regular price: $46.00 CDN, on sale for 25% off). 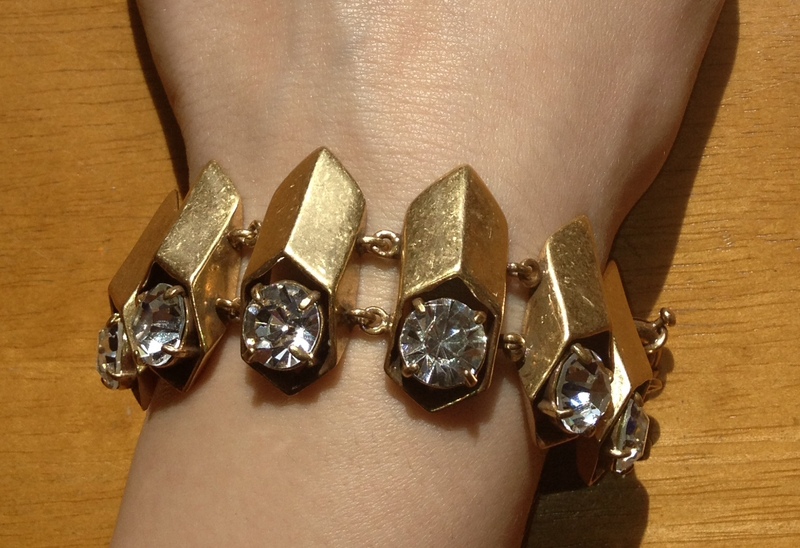 I was at the checkout paying for my new earrings, above, when I saw the sales associate wearing this gorgeous bracelet. I was pleasantly surprised to find that they still had them in-store, and even more excited that it was on sale! Regular $90.00 CDN, on sale for $49.99, then marked down an additional 40% off, I scored this baby for only $29.99! Made of brass with glass stones, I almost found it to be Lady Gaga-esque (am I crazy?). 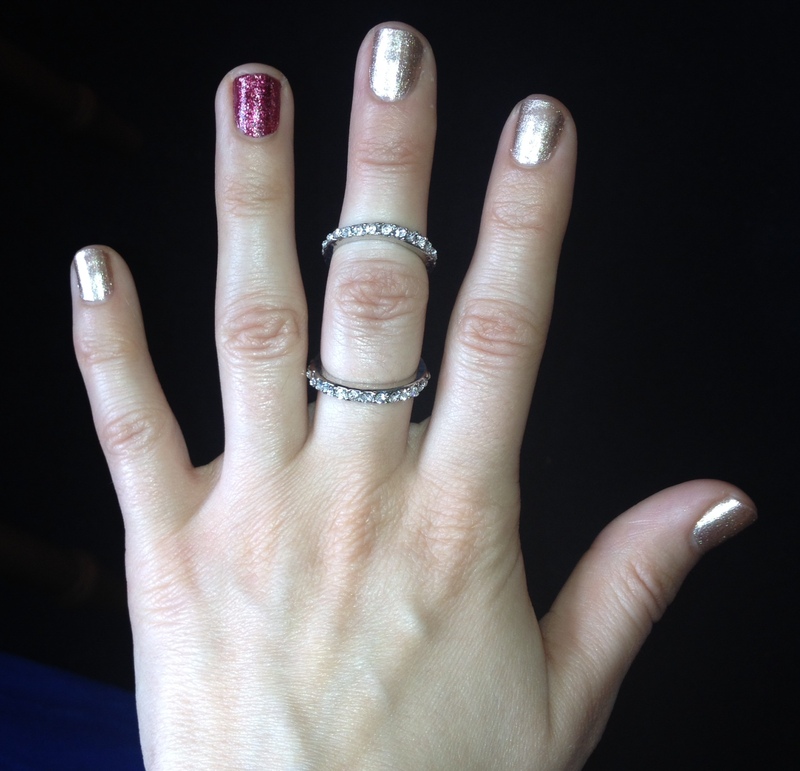 I also love that the adjustable length allowed it to fit my (ridiculously) small wrists. Known for their stylish and affordable shoes ($39.99 a pair, learn more here), Justfab.ca also offers fun purses, jewellery, and accessories. As a member/email subscriber, I recently received a $10.00 store credit, and decided to give their website a browse. I came across this statement ring (which comes in both silver and gold), and after reading all the positive reviews, decided to add it to my cart. I love that it looks like two rings, when actually, it is x-shaped at the back, which holds it together (yes, it is quite comfortable, and yes, I can still bend my finger). Did I also mention it is extremely reasonably priced at just $6.95?! 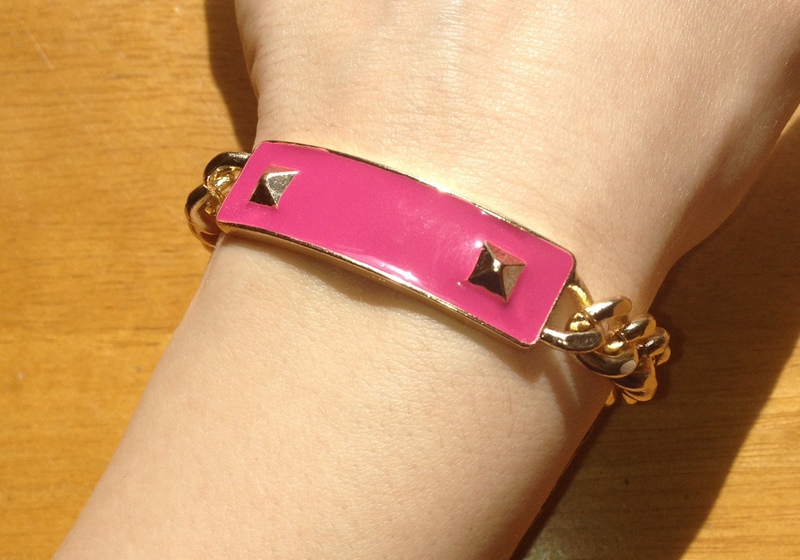 I’m always on the lookout for layering pieces, so when I spotted this hot-pink and gold bracelet, I couldn’t help but daydream about how nice it would look paired with a gold watch (does anyone else do this too?…maybe not). Again, the adjustable sizing allows it to fit my small wrists, and for the price (only $9.95), it is quite durable. If the colour pink isn’t your thing, it also comes in a really cute white/gold combo. Winners (similar to the US “T.J. Maxx”) offers brand names at lower prices on a per-store basis. Because of this, I can’t find them online, but I can say that Winners has a ton of great statement necklaces and earrings in-store right now. I purchased these earrings for 2 reasons: 1. because they’re shiny and beautiful and I had to have them (typical girl, right? ), and 2. because royal blue is my absolute favourite colour. At just $14.99, these earrings are a bargain that I’ll be sure to get a lot of use out of.